How to Boost your immunity and achieve total health. THE 6 WEEK HERBAL DETOX PLAN provides a revolutionary approach to total health and wellbeing. 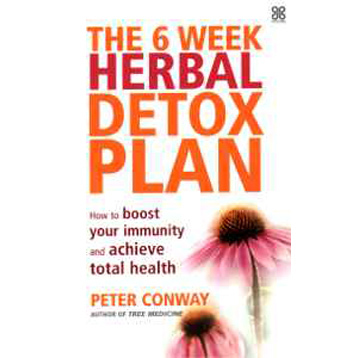 In his new book respected medical herbalist Peter Conway details a step-by-step programme for achieving optimum health in each of your body’s vital systems. From your digestive system to your immune system, and from cardiovascular health to emotional balance. Peter Conway explains which herbs you should take to promote optimum health and prevent disease. In just six weeks you will enjoy amazing new levels of energy, vitality and happiness. Peter Conway Dip.Phyt. MNIMH MCPP DTM Cert. Ed is an experienced medical herbalist and runs his own private practice in Tunbridge Wells, Kent. He is a member of the National Institute of Medical Herbalists and the College of Practitioners of Phytotherapy and helped to establish the BSc in Herbal Medicine at Napier University. He is editor of the British Journal of Phytotherapy and his work has been featured in numerous publications as well as on radio and television. He lectures widely, both in the UK and internationally, and he is the author of Tree Medicine (Piatkus).